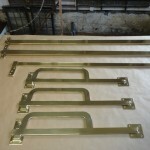 Martin made these bespoke brass shutter bars for a large Georgian house in Scotland. This was a fiddly project – but the finished results look amazing. We don’t have any photos of them in situ, but will blog them when they come through our client. If you are interested in talking to us about shutter bars we have made plenty over the years, so please get in touch.